“Lamb of God” is a musical portrayal of the final days of the life of Jesus Christ, from the foreshadowing raising of Lazarus, to the devastating arrest and crucifixion of Jesus, and finally to His glorious resurrection. Composed and written by Rob Gardner, the story is told through the ever-relatable perspective of those who loved and walked with Him: Peter, John, Thomas, Mary and Martha of Bethany, Mary Magdalene and His Mother Mary. In the summer of 2010, just weeks after completing the score, Rob Gardner headed to London to record the work with the world-renowned London Symphony Orchestra. He then returned to Arizona to record the soloists and glorious Spire Chorus in the weeks leading up to the performance premiere at Gammage Auditorium in Tempe AZ in September 2010. 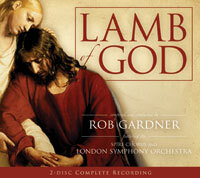 “Lamb of God” offers a new and unique take on the Passion story in that it's told entirely through music. The music serves to heighten the innate emotion of the narrative and carry a very personal meaning to everyone who experiences it. The Gospels of the New Testament were the sole source material in the composition of “Lamb of God”. Because of this, the work is performed every year, all around the world, by thousands of musicians and singers across dozens of faiths. It is performed in concert halls, Catholic Cathedrals, Protestant Sanctuaries, Evangelical Churches, Latter-day Saint Chapels and on University campuses. Most of these performances are multi-denominational, involving members of as many as 60 different faiths in one performing group alone. In fact, the artistry of the music and storytelling is such that even many non-believers are moved to participate in or attend a performance. In this year, 2017, alone, an estimated 4,000+ performers across the world have participated in locally-produced performances of “Lamb of God” in places as far-reaching as the Netherlands, Romania and Buenos Aires. These performances played for a total audience of well over 50,000 people from dozens of faiths. Almost all of these performers, both professional and amateur, volunteered an enormous amount of time and talent to share this message because they believed it would transform and bring a measure of hope and light into many lives, including their own. This is the power of this music and message.